There are many Cheap Landscaping Ideas that will still create wonderful front and Backyard Designs. Now when I see "Cheap", that's not what I really mean. I should have said inexpensive. There isn't any part of the landscape where you can't reduce the costs creatively. If you have looked at the more expensive hardscape materials such as brick, bluestone and other natural stone, you are considering the more expensive paving stones. Yes, they can be very beautiful, but that's not to say you can't still have a beautiful patio or walkway design. Concrete pavers are less expensive than the above choices. Even less costly than pavers is concrete. Consider adding color to the concrete mix for some additional interest. Landscape retaining walls can get very expensive. Costs are estimated by the square foot of one side, but six inches is added on in height for the part of the wall that is built beneath the ground. As an example, if you have a wall that is twenty feet long and two feet high, the square footage would be fifty feet. If you are considering two materials and there is a twenty dollar price difference, that's one thousand dollars. If you are looking to install an inexpensive wall, I would suggest some of the decorative concrete block walls. The plainer they are, the Cheaper they will be. You might want to go one step up and choose one of the "mosaic" styles for a bit of a more natural look. Always go for good quality. Where you can save money is in the size of the plants. Some plants, such as perennials, are so fast growing that it hardly matters. Even those plants that grow more slowly will eventually be their mature size. A shrub that will grow to a maximum of four feet will get there no mater what size it starts out at. Of course, we don't want to be ridiculous here! Start with a size that is smaller than perhaps you would really like but still look attractive. Do you have woods on your property? Consider using black chain link fencing in or near the woods as it will just blend into your surroundings. You can also use less expensive fencing anywhere and plant heavily in front of it to camouflage it. 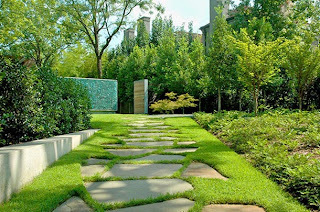 Should I Use an Online Landscape Designer?